When you can't decide between short or long sleeve, raise your game and keep cool with adidas' Techfit Climachill 3/4 Sleeve T-Shirt. 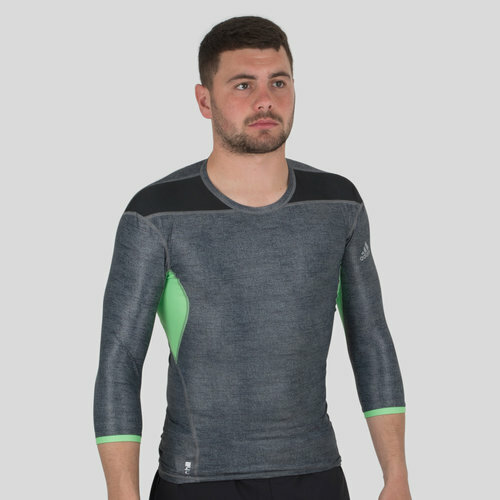 Created from a lightweight mix of polyester and elastane, get used to the supremely soft feel as it's going to sit right up against your skin for a medium compression fit that brings greater support and muscle efficiency. With such a thin design you get the benefit of a super quick drying time while there's always the option of wearing it alone or beneath other layers. Minimalist in design, and forming part of the adidas Techfit Collection the flat stitching enhances the overall comfort across the body and arms while the round neck collar sits lower on the neck than traditional base layer clothing. It's not just the performance which stands out but the rather distinct black melange look of the top, joined by flash green for added effect.